The story of legendary Guan Yu crossing five passes and slaying six generals. He played a major role in the civil war that led to the collapse of Han Dynasty & the establishment of Shu Han of the 3 Kingdoms, making Liu Bei its first emperor. 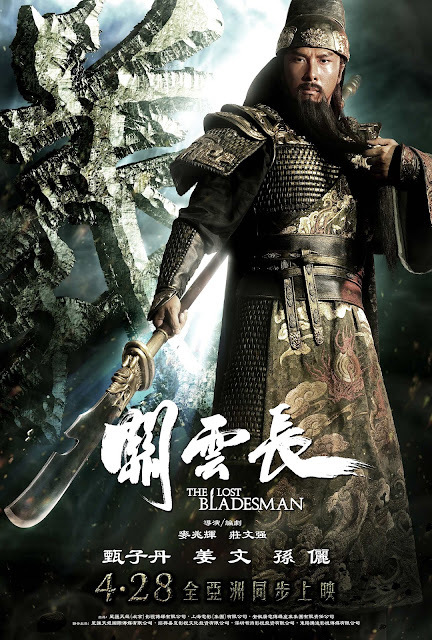 The Lost Bladesman is a Chinese film co-directed by Alex Mak and Felix Chong. It was released theatrically in China on April 28, 2011. The film is set during the Three Kingdoms era of Chinese history, and follows the story of Guan Yun Chang (played by Donnie Yen), a legendary warrior known for killing six generals in battle. An historical epic filled with spectacularly choreographed action sequences and equally impressive set pieces, the film scores high with entertainment value. Unfortunately the story is terribly inaccurate and anyone familiar with this period in Chinese history will be disappointed with the results. Donnie Yen is fantastic to watch as he travels across the country taking down scores of foes, but fails to show pretty much any dramatic range and leaves us with a flat one dimensional hero. Jiang Wen on the other hand, once again shows his chops as one of China's premiere acting talents as General Cao Cao, giving a wonderful performance of this complex character. Though he still can't save the weak screenplay that leaves out too many events and details for the film to make sense to anyone new to the story. See this one if you enjoy ancient Chinese warfare and superhuman martial arts displays, because it delivers them in incredible fashion. Avoid it if you want anything resembling a realistic and accurate historical drama. Eh.. Not a huge fan of ancient Chinese warfare. And I've tried too in these movies, a lot. I just give up and figure I might get into it later on. Shame. I like Donnie Yen. yeah, it takes a good one to get me into it. This looks great. I'm guessing you've probably seen Red Cliff as well, which I really enjoyed and was surprised to find out it was a John Woo picture. He's come a long way since the days of Face/Off and Broken Arrow! That's the problem with a lot of these, like Red Cliff but still good fun.